He had weight problems and was arrested for drink driving - no, I'm not talking about some off-the-rails rockstar, this is about Julio Cesar Chavez Jr and the build up to his fight with Marco Antonio Rubio. Billed as the Mexican prodigy's toughest fight yet, Rubio was actually a walkover for a Chavez Jr who wasn't completely focused. As we said earlier in this blog, Rubio had a good 2011 and carried momentum with him to the fight, but it must have settled in a chair at ringside because last night it was not in the ring. Chavez Jr won a unanimous decision with scores of 118-110, 116-112, 115-113. Fair scores aside from the 115-113, which was being kind to Rubio. A lot of was made of Chavez Jr's weight issues, and it manifested in some sluggishness to his performance. This is to his credit and discredit; he comfortably beat a good fighter when he was at less than his best, but on the other hand he let himself get into that kind of shape in the first place. The weight and the drinking cast shadows on Chavez Jr's character, immediately drawing comparisons to his father, who also struggled with alcohol. Is it a sign of Chavez Jr lacking the athlete's motivation? Or is he struggling being under so much pressure? Because it is a hell of a lot for a young man to carry. Not only do his forty-six unbeaten fights mean he is expected to do great things, he is also trying to live up to his father's legend, the six time world champion. Whether he lacks motivation or not, he definitely has ambition. It seems like the pumpkin fights are out and it's real opponents from here on out - next Chavez Jr wants Margarito, Cotto or Martinez. I think he'll get Margarito and beat the hell out of a big name who has long been on the decline. Were we spoilt last night or what? Not only did we have some British action with Quigg - Arthur and a rematch between Cunnignham and Hernandez, but we also got a dose of the Filipino Flash to round off the night. Last night Ninito Donaire did what he's accustomed to and easily beat Wilfredo Vazquez Jr.
Last time out Donaire got a lot of criticism for putting on a snoozer with Omar Narvaez, meaning he had two aims yesterday: 1) Put some excitement back into his game and 2) Prove his speed and power would move up to super bantamweight with him. Did it happen? Well sorta. He won by split decision, a sign that one of the judges was a little too lenient on Vazquez. 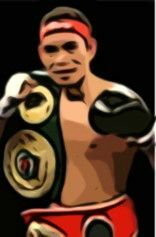 Despite injuring his left hand early in the fight, Donaire controlled a match where his 'W' was never really at risk, and as expected, he showed he can mix it at super bantamweight. But what about the excitement he promised us? The truth is, he couldn't bring it. Vazquez frustrated him through most of the fight, recovered from a couple of wobbly moments and generally proved hard to take down. It wasn't until the ninth that Donaire was able to put him on the floor, but this is a weak criticism really. Donaire might have taken nine rounds to do it but he still put Vazquez down; he just wasn't able to finish the job. He's settled into super bantamweight nicely and I'd expect Donaire - Rigondeaux to be made this year.